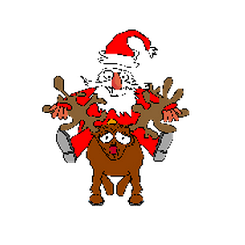 Regional bus services in the Galway metropolitan area over the 2012 / 2013 Christmas and New Year period. A park-and-ride service will be in place for the 2012 Christmas shopping period. 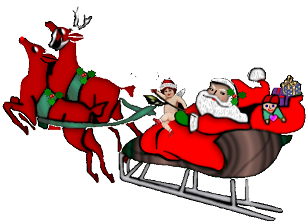 It will operate between Saturday 1 December and Monday 24 December, inclusive. On 24 December (Christmas Eve), the last bus will leave the city-centre at 5pm, and the gates at Ballybrit will close at 6pm. Parking is provided at Ballybrit Racecourse - follow the signs on the major routes into Galway. From 11am - 7pm on Sunday. The fare is €2 per car, now matter how many passengers. 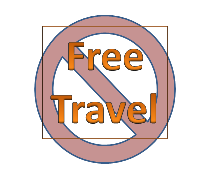 This includes all-day parking, and return bus travel. If cars are left overnight, it is entirely at owners risk. Details of December 2012 public-transport fare increases for Galway have been released by the National Transport Authority. These fares may apply from 1 December 2012 - though some may be applied from a later date. bank / public holiday in Ireland. Bus Éireann and City Direct will run their their standard Sunday city services in Galway on Sunday 28 and Monday 29 October. One Bus Éireann Dundalk / Galway and one Tuam / Athone return service are cancelled on Sunday 5th. On Monday 29 October, Bus Éireann will operate a Sunday timetable with various cancellations, additions and time changes. For details see their announcement. Irish Rail have a number of service changes for Galway on Sunday and Monday. See their Journey Planner for details of services that are operating. Iarnród Éireann / Irish Rail are offering an extra 20% discount for train fares booked on-line between 2pm on Wed 17th October and 2pm on 19th October. This discount applies to employees of companies that offer the TaxSaver scheme - including people who do not otherwise use the TaxSaver scheme. To access this offer, ask your company's TaxSaver administrator to get the discount code to enter in the Payment page. If you are unsure if your company offers TaxSaver tickets, contact your Human Resources section to check. 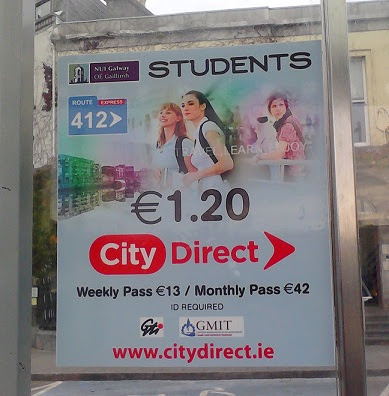 City Direct have introduced a student rate of €1.20 per trip for students at GMIT, NUIG and GTI. This price is available Monday to Friday on route 412 buses only. A valid student identification card is required. 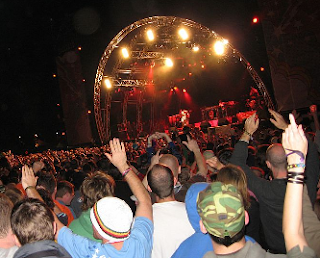 Weekly passes are also available for €13, and monthly passes for €42. See Galway City Bus Fares for details of fares on all city bus services. Annual fares for Bus Éireann's Galway city services will increase to €676.50 from 1 November 2012 (increased from €638.00). Note: annual tickets are only available via the Taxsaver scheme. Monthly and annual ticket prices on Bus Éireann's regional (aka "stage carriage") services are also increasing by on average 6%, from the same dates (annual from Nov 2012, montly from Jan 2013). Annual and monthly tickets for Iarnród Éireann / Irish Rail services are also increasing on the same dates: the price-rise varies between 9.9% for "Zone A" and 2.53% for "Zone K". Further information about the background to these changes, and the details of fare-changes in other areas, see the National Transport Authority's press release. See City bus services and Regional bus services for full details of all companies offering services in these areas. 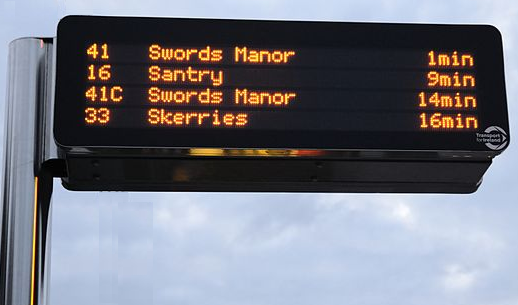 "Proposed" locations for the RTPI (real time passenger information) displays for Galway city have been announced in the Galway Advertiser today. It was previously announced previously that 20 signs would be installed in Galway during 2012. It is not clear what the status of this announcement is, whether the locations are fixed or open for public consultation, or whether the signs will show all city bus services or just ones operated by Bus Éireann. Places listed in the proposal are shown in the map below. That it's not always clear which side of the road the sign(s) will be on - a best approximation has been made, and this will be updated as further information becomes available. The following information is for the September 2012 meeting. See Galway Races Public Transport for the latest announcements. 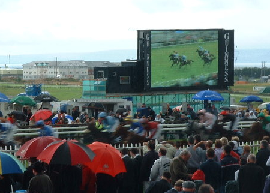 Galway Races early-autumn meeting runs from Mon 10 to Wed 12 September 2012. Unlike the summer meeting, there are no shuttle buses from Eyre Square or from surrounding towns. Route 403 - Ballybrit and 409 - Parkmore buses both go from Eyre Square to the Avenue entrance, as shown on the Parkmore neighbourhood map. Regular city fares apply. Fri 31st Aug - Sun 2nd Sept 2012. Rre running buses from Galway Cathedral (8:30am - returning 10:30am Monday) - and also from Donegal, Sligo, Westport / Castlebar / Claremorris, €35 return. Book on-line. Running a coach from Galway, leaving at 11:30am on Friday. Bookings are essential. Contact them for details / bookings, through their website. Running a bus from Galway Cathedral, Friday at 11.30 AM and returning 10 AM on Monday morning. €34 return. Tickets on sale in OMG@ZHIVAGO, 5 Shop St., Phone 50 99 60. If you travel from Galway to Portlaoise by train, there is a shuttle bus from Portlaoise railway station. See the Electric Picnic website for details. Kelly's are running buses from Limerick, Tipperary and Cork. Furey's may run services from Sligo, Carrick On Shannon, Longford and Mullingar. Bus companies: please email editor@galwayTransport.info if you would like your service from the west-of-Ireland to be listed here. 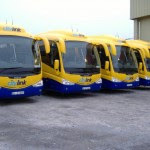 CityLink have announced changes to their Galway - Dublin services from Mon 27 August 2012. The 5am, 9am, 11am, 3pm and 5pm buses from Galway will not stop between Athlone and Dublin City. The 5am, 9am, 11am, 3pm and 5pm buses from Dubln will not stop between Dublin City and Athlone. See the Regional Buses Services page for other companies operating on this route. Traffic congestion in High St, Tuam. See the announcement on their website for details of the affected services, and their timetables for details of all their services between Galway and Tuam, Clonboo, Headford, Ballinrobe, Miltown, Dunmore, Corofin. See the Regional Buses page for information about all companies running bus services to / from / through Galway. From Sunday 5 August, the Route 405 - Ballybane bus will not serve Walter Macken Rd. Instead, it will go along St James Rd in both inward and outward directions, and turn around in Ballybrit Industrial Estate, using the new bus-stop in the turn hook installed when the Morris Roundabout was removed. The updated route map is available here. This is complementary to the "HP factory run" bus that services the estate on weekday mornings and evenings. See City Bus Details for timetable and route map links. The following information is for the 2012 Galway Races. The Galway Races Summer Meeting is from Monday 30 July - Sunday 5 August 2012. Bus Éireann shuttle buses will run from Eyre Square. Details below. Farrell Travel are running a Nightlink service to/from Athenry daily during race week, and shuttle services from Athenry and Oranmore. Details below. Both the route 409 - Parkmore and route 403 - Parkmore via Castlepark and Ballybrit city buses also go to the racecourse (Avenue entrance). But there are some restrictions during peak racing traffic hours Mon - Fri. Details below. There are some alternations to regular regional buses during race week. Links below. Bus Éireann are running special races shuttle buses from Eyre Square on each day of the Galway Races summer festival meeting (30 July - 5 August 2012). The departure point is outside the Skeffington Arms Hotel on the west side of the square (map), and the buses go to the tunnel entrance of the racecourse. Return services are available after the meeting finishes. These are shuttle buses, and do not pick-up or drop-off along the way. Farrell Travel are running races-special buses from Oranmore village to the Galway races. Return buses leave 1/2 hour and 1 hour after the last race each day. Some hotels in County Galway offer packages that include races tickets and access to a shuttle-bus - contact them directly for more information. The usual city bus fares (including use of Travel Pass) apply. The last bus-stop serviced during these times is at the top of Doughiska Rd (route 409) or Clayton Hotel (route 403) - both shown on the Doughiska neighbourhood map. People travelling at these times on route 403 or 409 to the racecourse, or to/from work in Parkmore area (Parkmore West Industrial Estate, Parkmore East Business and Technology Park, Galway Technology Park, Racecourse Business Park Briarhill Business Park), will need to walk for approx 15-20 minutes from this last stop. There are now traffic lights at the intersection, but these may be under manual / Garda control. There is also a pedestrian underpass beside the Clayton Hotel. NB These times are based on the overall road closure times in the area, and may be extended if there are traffic management problems in the area. 7am from Dunmore to Galway. 7am from Tuam to Galway. 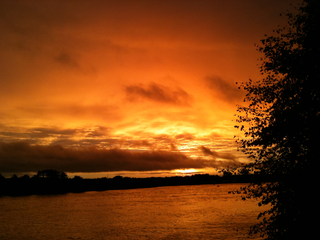 5:10pm from Galway to Dunmore. There may be other changes - these will be added as they become available. An additional trains will run from Athlone to Galway on Wednesday and Thursday, stopping at Ballinasloe, Woodlawn, Attymon and Athenry. Special late services will operate after the race meetings on Wednesday and Thursday, to both Dublin and Limerick. Further details are in Iarnród Éirean's press release. Bus Éireann and City Direct will run their their standard Sunday city services in Galway on Sunday 5 and Monday 6 August. One Bus Éireann Tuam / Athlone service is cancelled on Sunday 5th. On Monday 1 August, Bus Éireann will operate a Sunday timetable with a number of changes (both cancellations and additions) that affect Galway services. See their announcement for full detals. Irish Rail are likely to have a number of service changes for Galway on Sunday and Monday. See their Journey Planner for details of services that are operating. 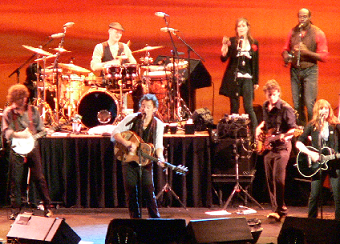 Reaneys of Galway will be running a coach from Galway for the Bruce Sprintsteen concert in the RDS in Dublin on Tues 17 July 2012. The bus will leave Galway at 2:30pm, and bookings are essential. Contact them for details / bookings, through their website. 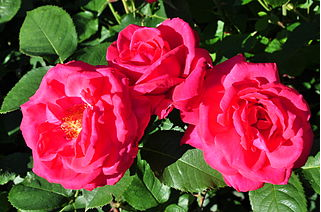 Galway Garden Festival is being held at Claregalway Castle on 14th -15th July, 2012, from 11am-6pm each day. The castle is on the N17 at Claregalway, and there are likely to be traffic restrictions and delays. A free Courtesy Bus will run from Galway Railway station to the Festival every hour from 10:30am. Regional Buses - for a full list of services to Galway. Public transport hubs map - locations of the private bus station and the Railway Station / Galway Travel Centre. City Direct bus routes and number are changing from Monday 2 July 2012. Route 33 becomes Route Route 411 - Cappagh Rd, operating at 1/2 hour frequency (quarter to and quarter past every hour), along the existing route. Route 35 is renamed Route 414 - Barna, and travels via the university and Knocknacarra. Further information and timetables are available from City Direct's refreshed website. See City Bus Services for route map and timeable links for all city services. 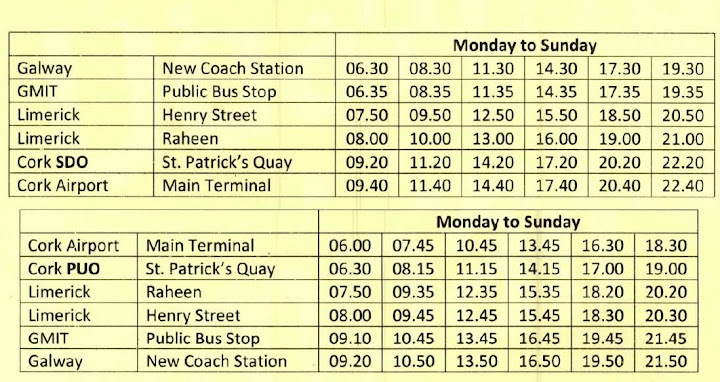 Bus Éireann are running extra late night buses to locations around the county during Volvo Ocean Race 2012 week (Sat 30 June to Sun 8 July, inclusive). These buses will leave Galway Bus Station / Ceannt Station at 11:30pm each night. These fares are only available from bus-drivers or Galway Travel Centre. For towns on these routes where the regular day return fare is less than €10, regular fares apply. For more information, see Bus Éireann's press release. Regional Bus Services for other bus services in County Galway. 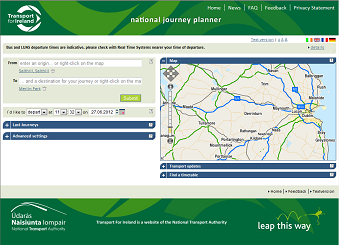 The National Transport Authority's Transport for Ireland website now has a Journey Planning tool, which finds public transport options for travelling to/from any points in the Republic of Ireland and Northern Ireland. This is the first version of the tool - some aspects are still being worked on so the results should be interpreted with care initially. 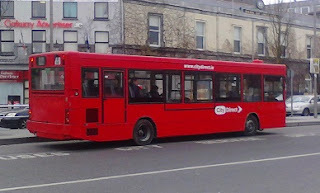 When the new bus routes for Galway city were announced in March 2012, it was noted that no public consultation was required to decide on the routes or services provided. The National Transport Authority (NTA) is running a public consultation to "seek the views of the public and interested parties (including users of the public bus services) on the approach to be adopted in relation to new contracts for provision of public bus services" in 2014. 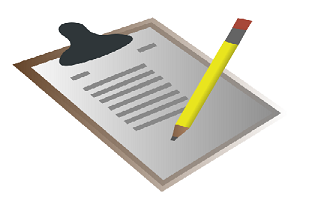 There is a consultation document, and a questionnaire to be completed by before 5pm on Wednesday 11 July 2012. More details are available from their website. A park-and-ride service will be in place between Ballybrit Racecourse and the city-centre for the Volvo Ocean Race 2012. It will operate between Saturday 30 June and Sunday 8 July, inclusive. Buses will run every 5 minutes between 9am to 11.30pm each day. This includes all-day parking, and return bus travel. Cars are not permitted to park over night. If they are left overnight, it is entirely at owners risk. 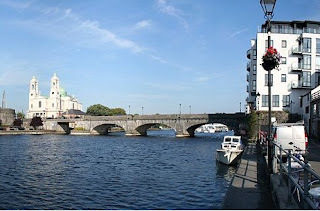 This is a short (5-10) minute walk from the Galway Docks area, and 15 minutes walk from the Claddagh / South Park area. 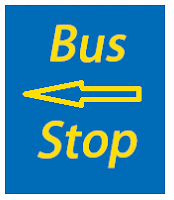 Buses to Salthill can be caught from Bus Stop 9 in nearby Eyre Square. Reaneys of Galway will be running a coach from Galway for the Westlife concert in Croke Park on Fri 22 and Sat 23 June, 2012. 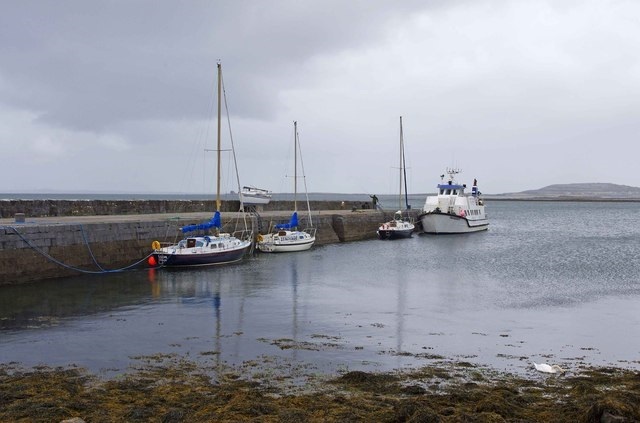 Ballyvaughan Bay Hop will run a fast ferry service between Ballyvaughan, Co. Clare and Galway City from 25 - 30 June 2012. This is a trial service during the Volvo Ocean race, but is also a pilot for a more permanent service. 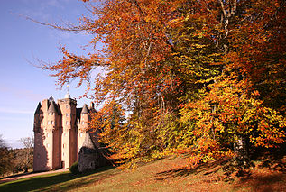 Single - €10, Return - €18, multi-trip tickets also available. Commuter parking is available at the pier in Ballyvaughan. Accommodation and meal value packages with Ballyvaughan eateries and guesthouses are available to passengers from Galway. O'Brien Line - Doolin Ferry will also run a service on Friday 6 July. From Fri 22nd June, Citylink's 7:15pm and 9:15pm services from Dublin Airport will run daily, instead of Friday and Sunday only. Also services from Dublin to Galway city now pick up from North Wall (opposite the Clarion Hotel) as well as Aston Quay (near Ha'penny Bridge). For more information, see Citylink's website. Connemara Chamber of Commerce are organising a shuttle bus between Clifden and Galway on 6th, 7th, 8th July, to encourage Volvo Ocean Race attendees to stay in Connemara. Contact olivebrennan@eircom.net for details. On Mon 18th June, CityLink's Galway to Cork service will switch to a limited-stops express service. 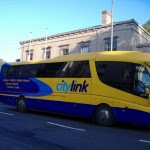 Therefore Citylink will no longer be stopping at Oranmore, Kilcolgan, Gort, Crusheen, Croom, Charleville, Ballyhea, Buttevant, Mallow or University College Cork (UCC). For more information, see Citylink's website, or this updated announcement. On Mon 18th June, CityLink will start running a Galway to Cork Express Coach Service. The existing Galway/Cork multi-stop / commuter service is cancelled. Limited stops: Galway city, Limerick city, Cork city and Cork airport. Travel time, Galway and Cork: 2 hours and 50 minutes. Travel time, Cork and Limerick 1 hour and 30 minutes. Bus Éireann will run regular regional / national services on Sunday 3rdh, except that one Galway/Dundalk service and one Tuam/Athlone service are cancelled. Details. On Monday 4th, Bus Éireann will operate to a Sunday timetable, but with a number of changes (both cancellations and additions) that affect Galway services. See their press-release for full detals. 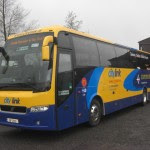 CityLink are running their normal timetable, but have announced that from 5pm Sat 2nd June to 10 am Mon 4th June, Dublin City pickups will be at Wood Quay, instead of Aston Quay. See their map for details. Drop-offs will still be at Bachelors Walk if possible, but some services may have to drop off at Arran Quay. GoBus are running their normal timetable, but say that services from Galway between 3:45pm Sat 2 June - 8:45pm Sun 3 June will drop off at Heuston Station and Dublin Airport only. Services from Dublin City 6:16pm Sat 2 June - quarter past midnight on on Monday 4th June 2012 (inclusive) will pick up passengers at Dublin City Council Civic Offices at Wood Quay. Bus Feda on Sunday and Mon will operate their normal Sunday service with some changes to the normal Sunday timetables - details. Galway / Dublin - normal Sunday services. Galway / Limerick - normal weekday services, with one cancellation. 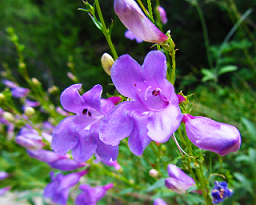 The following information is for May 2013. See this year's holiday arrangements for current information. 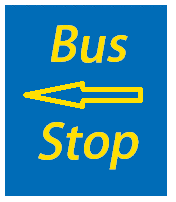 Most Galway city bus services and regional and national bus services will run their standard Sunday-timetable service on both Sun 6 and Mon 7 May. Bus Éireann will run regular regional / national services on Sunday 5th, except that one Galway/Dundalk, a Sligo service, and a Tuam/Athlone service are cancelled. Full details. On Monday 6 June, Bus Éireann will operate to a Sunday timetable, but with a number of changes (both cancellations and additions) that affect Galway services. See their press-release for full detals. Irish Rail will run close to normal Sunday services on both days to/from Galway, but there are a number of services changes in other parts of the country - see their timetable for details. The following information is for an earlier year. See Easter bus service information for up to date bus and train details for Easter weekend. 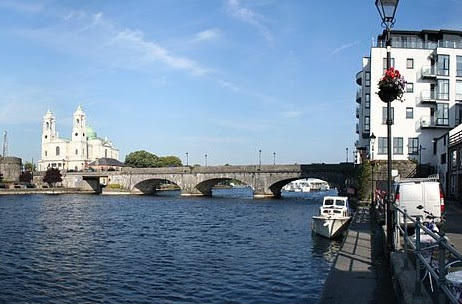 From 12 March 2012, CityLink's Galway-Dublin services will set-down at a bus stop on North Wall Quays, outside the Clarion Hotel, close to Samuel Beckett Bridge. This stop will be particularly handy for people going to the O2, Bord Gais Energy Theatre and IFSC, and is in addition to the current drop-off point on Bachelor's Walk near O'Connell St.
Their Dublin to Galway services (both commuter and express) continue to pick up passengers at Aston Quay, outside Eden Recruitment, near Ha'penny Bridge. See their website for full details, or Dublin city bus stop for a map of all major Dublin city bus stops that are used by Galway bus services. This announcement is about St Patrick's Day public transport information for a time in the past. See current St Patrick's day bus and train services for more recent announcements. Saturday 17th March 2012 (St Patrick's Day) is a public holiday in Ireland. Monday 19 March is a bank holiday, not a public holiday - but a large number of facilities will operate as they usually do on Sunday. Bus Éireann and City Direct will run according to the Sunday timetable on Sat 17th to Mon 21st inclusive. 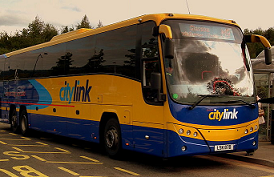 See City Bus Services for route maps and timetable links. See their press release for full details. will run a limited service between Galway and Tuam on Saturday 17th, regular Sunday services on the 18th and enhanced Sunday services on Monday19th. 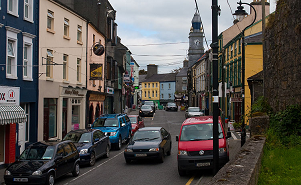 will be running a Saturday service to/from Athenry on Saturday 17th: their buses will not be able to travel through Eyre Square, so ,the pick up and drop off point will move to the Bus Stops near Shannon Drycleaners on Prosepct Hill. Are running a slightly different Galway / Dublin timetable for the weekend - bookings are recommended. Are running their normal Dublin / Galway timetable, but have some different pick-up and drop-off points due to parades in various torns. Have not made specific announcements: it is likely that they will run regular Sunday services from Sat 17th - Mon 19th inclusive. See Regional Bus Services for a full listing of all companies involved. Many towns will have parades around midday: bus services at this time could be delayed due to road closures. Irish Rail services from Sat 17 - Mon 19 March are based on a Sunday timetable, with some alternations. See their timetable for St Patrick's weekend 2012 for details. 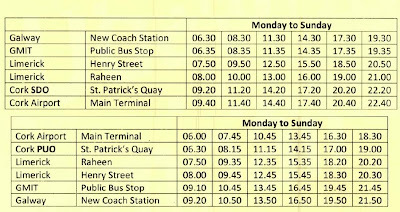 Bus Éireann have announced a range of bus route and timetable changes in Galway City, from Sunday 4 March 2012. They have provided a new stand-alone network map, and timetable details are available on their site now. A Google-maps based city summary map (including Bus Éireann and City Direct services) is available now. Route 2d - Knocknacarra is cancelled. The net effect is a reduction in the number of buses to/from Knocknacarra, on average from 3 per hour to 2 per hour. Route 4w - Newcastle becomes Route 404 - Newcastle: this uses the existing route to Newcastle, but goes to Westside Shopping Centre (via Siobhan McKenna Rd) to turn around and then travels back along the same route. There is no Sunday service on this route. Route 5e - Ballybane is replaced by Route 405 - Ballybane: All services will run through from Rahoon, through to Ballybane - via not past Liosbán industrial area (Tuam Rd) and new-Mervue. The summary map implies that buses turn around inside Ballybrit industrial estate, but this is not so initially. Route 7 - Ballinfoyle/ Bóthar an Chóiste becomes route 407 - Bóthar an Chóiste: there are no route changes, but the frequency is reduced to once every 40 minutes. Route 8 - Mervue is cancelled. The service it provides is replaced by the new Route 403 - Castlepark. Route 9a - Galway Clinic is replaced by Route 10 - Oranmore: this is an hourly service between Galway City and Oranmore, via Galway clinic, between 7am and 7pm. The new routes were presented to Galway City Council in January 2012, although there are some differences between the announced routes and media reports from that presentation (see here, and related articles from the City Tribune of 13-Jan-2012, which are not available on-line). These changes have been approved by the National Transport Authority, which is the government body responsible for licensing public transport in Ireland. There is currently no for process for public consultation about bus-service changes. Consultation with the City Council is a courtesy, and it is unclear how much influence they have over the final routes. Updated city bus route and summary maps for GalwayTransport.info are being prepared, and will be on the site shortly. Citylink fares for express and commuter services are increasing on 1 February 2012. 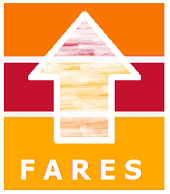 Exact fares have not been announced yet, but they say that " an average increase of approximately 5% will apply to all our fares and ticket classes". At the same time, Citylink are introducing a 10% discount for on-line ticket purchases. Full CityLink fare details are availabe on their website. Information about all bus services between Galway and Dublin is available on the Regional Buses page. Flybe will be operating flights between Leeds-Bradford (LBA) and Ireland West / Knock (NOC), from 25 March 2012. Three flights per week, bookings are being taken now. 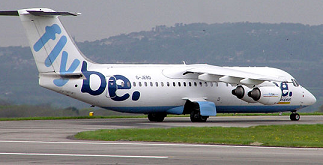 Further details of the Flybe service. City Direct Galway fare increases apply from 9 January 2012. See Galway city bus fares for full details, including weekly and monthly fares. TaxSaver has announced fare increases for train tickets, effective from March 2010. These rates will be applied on tickets purchased during February for use from 1 March. Indicative prices for a range of journeys are given here: http://www.taxsaver.ie/News/New-Rail-Rates-from-March-2012/. These are TaxSaver fares only. To access these tickets, your employer must be join the TaxSaver scheme and buy the tickets on your behalf. Members of the public cannot buy TaxSaver fares. Actual prices depend on the route travelled, and also your PRSI rate. See TaxSaver.ie for more details. Regular train prices are available from the Irish Rail website, and tickets can be purchased from Ceannt Station. See Regional Bus services for details of all national and regional buses to, from and through Galway. Details of 2012 Bus Éireann fare increases for Galway city have been released by the National Transport Authority. Adult city fares increase by 10c to €1.70. School-child city fare increases by 5c to €0.80. 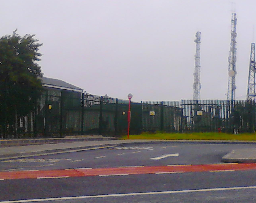 CityLink's Dublin-city bus stop is moving one block west on Monday 2nd January 2012. Their Dublin to Galway services (both commuter and express) will now pick up passengers at Aston Quay, near Ha'penny Bridge, not Burgh Quay. See their website for full details, or Dublin city bus stop for a map of all major Dublin city bus stops that are used by Galway services.